TRENTON – Acting Attorney General Robert Lougy announced that seven men were sentenced to state prison and jail terms today for conspiring in a $1.5 million series of thefts involving tractor-trailers loaded with cargo, including clothing, beauty products, auto parts and beer, which the defendants stole and fenced. The theft ring operated in New Jersey, New York and Pennsylvania. 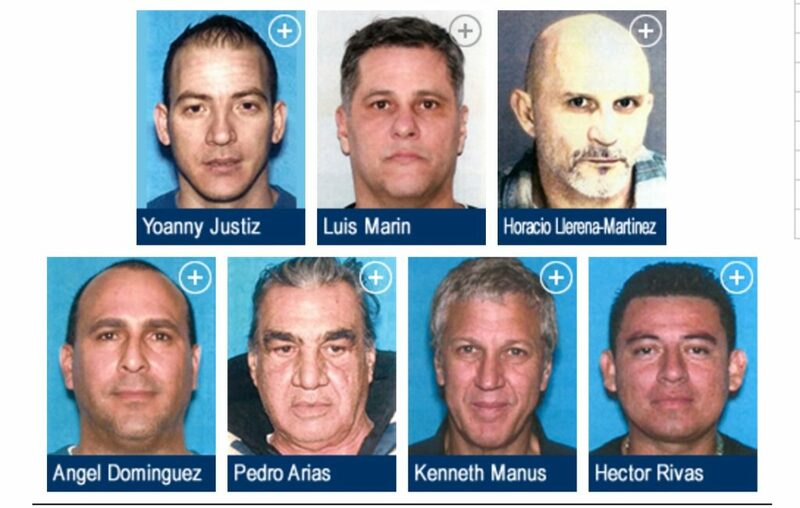 A total of 12 men were charged in a June 4, 2015 indictment stemming from Operation Midnight Run, a long-term investigation by the New Jersey State Police Interstate Theft North Unit, the New Jersey Division of Criminal Justice Specialized Crimes Bureau and the U.S. Department of Homeland Security Border Enforcement Security Task Force. Nine defendants have pleaded guilty to date. Yoanny Justiz, 33, of North Bergen, was sentenced to nine years in state prison. He pleaded guilty on Feb. 29 to second-degree conspiracy. Luis Marin, 47, of Union City, was sentenced to nine years in state prison. He pleaded guilty on Feb. 29 to second-degree receiving stolen property. Horacio Llerena-Martinez, 55, of North Bergen, N.J., was sentenced to eight years in state prison. He pleaded guilty on Nov. 30 to second-degree conspiracy. Angel Dominguez, 44, of Union City, N.J., was sentenced to seven years in state prison. He pleaded guilty on Nov. 30 to second-degree theft. Pedro Arias, 68, of Elizabeth, N.J., was sentenced to five years in state prison. He pleaded guilty on Jan. 25 to second-degree theft. Kenneth Manus, 61, of Norwood, N.J., was sentenced to 180 days in the county jail as a condition of three years of probation. He pleaded guilty on Nov. 30 to third-degree receiving stolen property. Hector Rivas, 38, of Union City, N.J., was sentenced to 270 days in the county jail as a condition of three years of probation. He pleaded guilty on Nov. 30 to third-degree receiving stolen property. Deputy Attorney General Debra Conrad, Senior Bureau Counsel, and Deputy Attorney General Danielle Scarduzio prosecuted the defendants and handled the sentencing hearing today for the Division of Criminal Justice Specialized Crimes Bureau. The members of the cargo theft ring worked together in various combinations to steal tractor-trailers containing cargo from the tri-state area of New Jersey, New York and Pennsylvania. They brought the stolen cargo to warehouses and lots in New Jersey, Brooklyn, N.Y., and the Bronx, N.Y. Between June 2012 and April 2015, ring members engaged in nine thefts and two purchases of additional stolen goods in which the total value of the cargo and tractor-trailers stolen exceeded $1.5 million. The stolen cargo included $120,000 worth of catalytic converters stolen in Linden, N.J., and recovered at a warehouse in Saddle Brook, N.J.; $190,000 worth of Moroccanoil hair and body products stolen in Allentown, Pa., and transported through New Jersey to a lot in the Bronx, N.Y.; and $152,000 worth of GNC fish oil capsules stolen in Paterson, N.J., and recovered at a furniture store in Hillside, N.J.
“Truckloads of cargo have always been a lucrative target for organized criminal groups. Our Interstate Theft Unit, along with our partners in Operation Midnight Run, are glad to have taken this group off the road and recovered large quantities of stolen goods,” said Colonel Rick Fuentes, Superintendent of the New Jersey State Police. “This case is an excellent example of how teamwork among state, local and federal agencies can disrupt these types of large-scale criminal activities and ensure that those involved are prosecuted to the fullest extent of the law,” said Special Agent in Charge Terence S. Opiola of ICE Homeland Security Investigations in Newark. Two other defendants have pleaded guilty in the case. Wilson Ferrer-Reyes, 51, of Union City, N.J., pleaded guilty on Jan. 4 to third-degree receiving stolen property and was sentenced on April 22 to 364 days in the county jail as a condition of three years of probation. Carlos Toriac-Almira, 36, of Union City, N.J., pleaded guilty on Jan. 25 to fourth-degree receiving stolen property and faces a recommended sentence of 18 months in state prison. He is scheduled for sentencing on Sept. 9. One of the indicted defendants was admitted by the court into the Pre-Trial Intervention Program. The indictment is pending against the two remaining defendants, Osmay Perez-Herrera, 51, of New York, N.Y., and Luis Requena, 24, who was deported after his arrest in 2013. They face first-degree charges of conspiracy and money laundering, as well as second-degree charges of theft, fencing and receiving stolen property. The charges are merely accusations and they are presumed innocent until proven guilty. Manus owned the warehouse on Midland Avenue in Saddle Brook where the Corning catalytic converters – stolen on June 20, 2012– were recovered. Manus fenced goods stolen by the ring, buying them himself or finding a buyer. At that warehouse, investigators also recovered pallets of beer – including a large amount of Guinness stout – worth more than $23,000, which allegedly were stolen by the theft ring in Easton, Pa. on June 22, 2012. Ring members rented space at a furniture store on Route 22 in Hillside, N.J., which they also used as a location for their fencing activities. In addition to the GNC fish oil supplements, which were stolen in Paterson on May 28, 2013, investigators also recovered the following stolen cargo there: over $77,000 worth of Bell bicycle parts stolen in Paterson, N.J. on May 28, 2013; about $65,000 worth of bedding, which was part of a trailer-load of $88,000 in bedding stolen from South Plainfield, N.J., on June 14, 2013; and over $9,000 worth of Little Hug juices stolen in Passaic, N.J., on July 1, 2013. The tractor-trailers stolen with the cargo were found at various locations. Osmay Perez-Herrera, who uses the name “Omar,” was co-owner of the Mi Pais Supermarket on St. Nicholas Avenue in New York, N.Y. Investigators conducted two sting operations in which goods that were purportedly stolen allegedly were sold to Perez-Herrera for resale at various locations, including at the store. The “stolen” goods consisted of $80,000 worth of perfume and 330 counterfeit North Face jackets. Perez-Herrera is charged with third-degree counterfeiting in connection with the jackets. a tractor-trailer containing approximately $201,000 worth of clothing, which was stolen in Elizabeth, N.J., on March 12, 2015 and transported to a lot in Brooklyn, N.Y.
a tractor-trailer containing more than $143,000 worth of Nivea skin lotion, which was stolen in Easton, Pa., on Sept. 25, 2013 and transported to a lot in the Bronx, N.Y.
a tractor-trailer containing more than $151,000 worth of Goodyear tires stolen on April 7, 2015 from Grantville, Pa., which Dominguez and Marin were transporting through New Jersey when they were stopped by investigators in Readington, N.J., and arrested. a tractor-trailer containing $100,000 worth of mozzarella cheese stolen on Sept. 27, 2013 from a warehouse in Sayreville, N.J. Arias was arrested on the New Jersey Turnpike after he and other defendants stole the cheese from the warehouse. Requena and Justiz were riding in a car immediately in front of Arias and also were arrested. Acting Attorney General Lougy commended the New Jersey State Police Interstate Theft North Unit and the U.S. Department of Homeland Security Border Enforcement Security Task Force for their work on the case. Deputy Attorney General Conrad and Deputy Attorney General Scarduzio presented the case to the state grand jury and were assigned to the investigation for the Division of Criminal Justice Specialized Crime Bureau, under the supervision of Deputy Attorney General Jacqueline Smith, Deputy Bureau Chief, and Deputy Attorney General Jill Mayer, Bureau Chief.